Onsite review of the entity’s mortgage production and servicing operation. 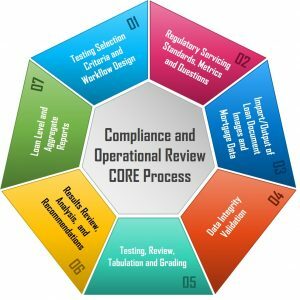 The review includes an evaluation of processes and procedures, staffing, controls, systems, financial management reporting and relevant support functions. Interview senior management and key managers and supervisors in each functional area of mortgage production and servicing operations to assess their capabilities and gather information on lending operations and mortgage banking opportunities and problems. Evaluate the loan origination and servicing systems as set­‐up and used by lending and servicing personnel to understand the ability of the systems to support improved procedures and workflows.